Sun servers delivers mission-critical availability and advanced system management tools that are perfect for databases, business applications, and e-commerce. 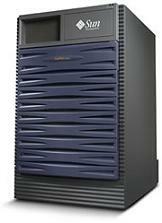 The modular design of the Sun server family simplifies upgrades and delivers exceptional investment protection. Sun servers support the Solaris Operating Environment, so you can choose from more than 12,000 off-the shelf applications. All this makes Sun servers a safe, versatile investment for growing businesses. For used Sun server, workstation and storage solutions, On Queue Computer delivers great value and expertise. Our offerings include the full spectrum of Sun systems, Sun memory and storage, as well as maintenance, repair services and parts. When looking for a full service reseller of Sun computer servers and storage products, On Queue Computer is the leader you can trust. On Queue Computer Products provides refurbished solutions based on expert design and valuable implementation support. On Queue Computer is pleased to provide quotes on Sun systems, workstations, memory and storage. Please contact On Queue Computer's Sales Desk at (877) 667-8383 for price and delivery on the items you require. Whether your goal is to stretch your IT resources or to acquire equipment that is used, On Queue Computer is a partner you can trust. We work hard to maintain one of the broadest, most complete refurbished Sun server inventories available anywhere. Immediate availability - Fast shipments from our extensive inventory of used Sun server systems, features and parts. Expert advice - Our Sun server experts are trained with an emphasis on design and configuration for specific application requirements to help maximize performance. High quality - All used Sun products are tested, cleaned, configured, and staged at our state-of-the-art facilities for reliability you can count on. We guarantee eligibility for OEM maintenance on all used equipment. Special Shipping - Used Sun server shipments are foam packed and/or palletized to avoid damage in transit. Priority, next day, and counter-to-counter deliveries are available, and most orders are shipped within 48 hours. Financial flexibility - We work hard to bring you the right used Sun equipment at the right price. Besides lease and purchase options, we can reduce your cost by taking trade-ins. Telephone support - If you need installation support for your used Sun equipment, our product engineers are available from 8:00 to 6:00 EST, Monday through Friday, for troubleshooting and answers. Guaranteed - Reconditioned Sun products are eligible for manufacturer's maintenance. We do more than dust and wipe. We build, test, and certify, our systems to meet the same quality standards as our new products. Every Sun remanufactured system is built to order and thoroughly tested -- at the component and system level. So our systems meet and typically exceed Sun serviceability requirements, which means our pre-owned products are immediately eligible for Sun Service coverage.